Weight lifting for brain health in your home gym-latest research. Weight lifting for brain health in your home gym just sounds like another advertising slogan. The amazing reality is that recent research has shown a very positive link between regular weight training and improvements in memory. 2 How to Do Weight Lifting for Brain Health in Your Home Gym. 3 What’s the Best Way to Improve Your Memory in the Gym? 4 Weight Lifting for Brain Health in Your Home Gym with an All In One Workout Machine. 5 Choosing a Home Gym Workout Machine. It’s long been known that cardiovascular activity such as running and swimming can have a significant impact on cognitive skills and overall brain health. However it is only recently that researchers have released findings showing the surprising link between weight training and cognitive functions such as long-term memory gain. That’s right, by lifting weights either at home or the gym, you can give your brain a boost and improve your memory. All at the same time as you are building physical strength. The findings, published in the Journal of American Geriatrics, show that the boost in memory occurs fairly soon in the process and lasts over 12 months. A recent study carried out at the Sydney University in Australia worked with a group of 55 to 85 year old’s with diagnosed Mild Cognitive Impairment. They did weight lifting sessions two times a week for six months, exercising to at least 80 per cent of their peak capacity. As they improved, the amount of weight they were lifting was raised to keep the intensity at 80 per cent of their peak strength. It turns out that the participants who did the weight lifting for brain health remembered 10 percent more than those that did not. And the gains were nearly immediate. How to Do Weight Lifting for Brain Health in Your Home Gym. While the researchers are not yet sure what caused the memory effect, they believe that the strength training somehow changes the chemicals and hormones in the brain. That fits with previous research into the effects of cardiovascular activity on the brain. This research found a link between aerobic activity and the production of certain chemicals and hormones in the brain. Earlier, a Harvard Medical School study showed that strenuous resistance exercise helps to stimulate the release of chemical hormones in the brain. The particular hormones released boost brain cell health and promote brain cell regeneration. That supports other studies showing an improvement in mental functioning in people suffering from neurodegenerative diseases such as dementia. This link between aerobic activity, strength training and brain health has profound implications for adults 55 and older. It’s time to be thinking of starting an exercise program. Not only are you getting all the strength, flexibility and wellness benefits of a good workout, you’re also boosting your brain’s cognitive functions. Weight training has already been shown to strengthen bone structure and reduce the likelihood of broken bones and osteoporosis among older adults. 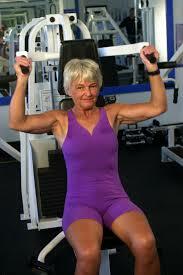 Now there is a real case to be made for weight lifting in older adults as both a fitness and wellness alternative. What’s the Best Way to Improve Your Memory in the Gym? For older adults (age 55 and older), going to the gym and working out with heavy free weights may no longer hold the allure it once did. For one, it’s more difficult to work into a daily schedule. And, secondly, the goals of younger people attending the gym – bulking up and getting ready for bikini season – may no longer resonate for those over the age of 55. Instead, older adults have more of the wellness goals of fitness in mind. That’s why an all-in-one workout machine for weightlifting for brain health in your home gym makes sense. It lets you focus on the core as much as the big muscle groups in the arms and legs. It also enables regular exercising to be done in the privacy of your own home. Weight Lifting for Brain Health in Your Home Gym with an All In One Workout Machine. All in on workout machines. Ideal for the home gym. There are several other reasons why these all in one home gyms make so much sense for older adults. One is the ability to customize exercises for just exactly your fitness goals. 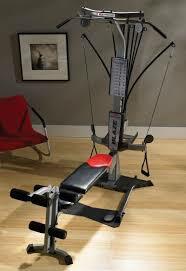 And you are guided through a much safer range of motion for your muscles with these machines. Instead of risking injury with free weights, you are able to minimize the chances of causing any long-term injury to your body (such as your back!). Plus, from a purely cost-benefit perspective, the cost of an all-in-workout machine nearly pays for itself in less than a year. Assuming you’re paying close to $100 per month for your pricey gym membership, even a workout machine that costs close to $1,000 more than pays for itself in just 10 months. The good news is that there is an array of all in one workout machines that can meet your goals at a variety of price points. In picking the best machine for you, focus on the all in one machines that offer the basic exercises and that are compact enough to fit in a room at home. Choosing a Home Gym Workout Machine. At the low end of the price range, the multi-station Marcy MWM-988 is a clear winner. It offers a 150 lb. weight stack (which is more than enough for simple toning and strengthening), a compact design, and plenty of upper and lower body exercises for any fitness routine. 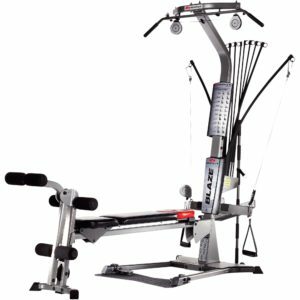 The best of the mid-range machines is the Bowflex Blaze, which offers a great mix of functionality, design and versatility. It’s compact enough to fit in any room of your home, but it also offers 60 different exercises (compared to 20-25 exercises for the typical machine). Finally, if you’re looking for a high-end all-in-one home gym, the Bowflex Xtreme is a step up from the Bowflex Blaze. It uses the same Power Rod Technology, but offers 70 different exercises. This is a complete toning and slimming home gym that’s compact, made of sturdy materials, and looks great in any room of the house. It’s easy to see how any of these machines could help you to boost your memory. All of them come with leg extension exercises and the option of heavy resistance work on the biggest muscles of your body – your arms and legs. You may not be bulking up physically, but you’ll be bulking up mentally! These all in one workout machines appear to offer the most effective and efficient exercise for seniors, providing safe weightlifting for brain health in your home gym. Compact Home Gym: How to Know If This Is Best For You?